This month, the Syrian conflict entered its eighth year. What began as a series of peaceful protests in March 2011, swiftly erupted into civil conflict and then into an international proxy war as the battle for Syria intensified. In this series, we examine the roots of the Syrian conflict and how it became an international proxy war, the impact of the conflict on civil society, the consequences for Syria’s rich cultural heritage, and the work being done to protect a culture in crisis. 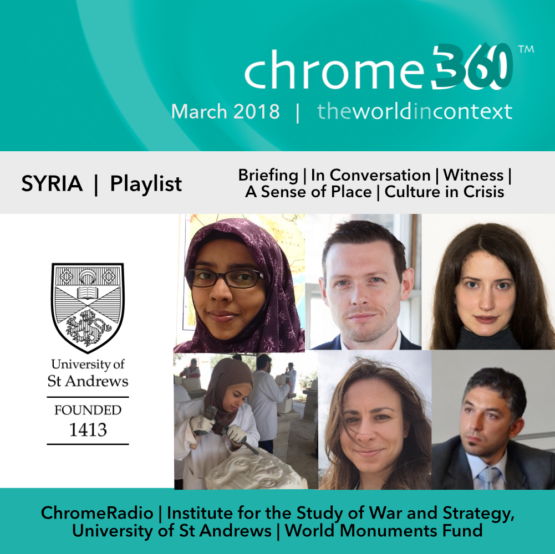 ChromeRadio production in partnership with the Institute for the Study of War and Strategy at the University of St Andrews – also our partner on the Chrome360 Iran series – and World Monuments Fund. Briefing: Dr Jasmine Gani, Lecturer in International Relations, University of St Andrews and Associate Director, Centre for Syrian Studies, explores Syria past and present, the role of the al-Assad family in shaping modern Syria, and how the actions of other states have often directed the country’s domestic agenda. In Conversation: Dr Jasmine Gani in conversation with Dr Chris Phillips, Reader in International Relations, Queen Mary, University of London and an Associate Fellow, Middle East and North Africa Programme, Chatham House on how Syria’s civil conflict became an international proxy war, and the ongoing battle for Syria. Witness: Dr Haian Dukhan, Teaching Fellow in International Relations, University of Leicester, on growing up in Palmyra and the role of Syria’s tribes in the conflict, and Dr Daria Vorobyeva, Centre for Syrian Studies, University of St Andrews, on the impact of the conflict on Syria’s refugees, focusing on Armenian Syrians. Culture in Crisis: in 2017, World Monuments Fund – with the support of the British Council, coordinating the Cultural Protection Fund, and local partner, the Petra National Trust – launched its stonemasonry training programme at Mafraq in Jordan, 12 miles from the Syrian border. We hear how Master Mason Tony Steel, Assistant Trainer Nour Al Shdaifat, and local manager Bara’a Al Falah are training Syrians and Jordanians to become the craftspeople and conservators of the future. A Sense of Place: Dr Jasmine Gani in conversation with physicist Dr Alexy Karenowska, Fellow of Magdalen College, Oxford and Director of Technology at the Institute for Digital Archaeology, on how 3D printing and machining technologies can help restore and replicate monuments damaged or destroyed during the conflict, such as Palmyra’s triumphal arch, which was razed to the ground by ISIS in 2015. This entry was posted on Monday, March 19th, 2018 at 12:02 am and is filed under Chrome360, News, Our work. You can follow any responses to this entry through the RSS 2.0 feed. You can leave a response, or trackback from your own site.